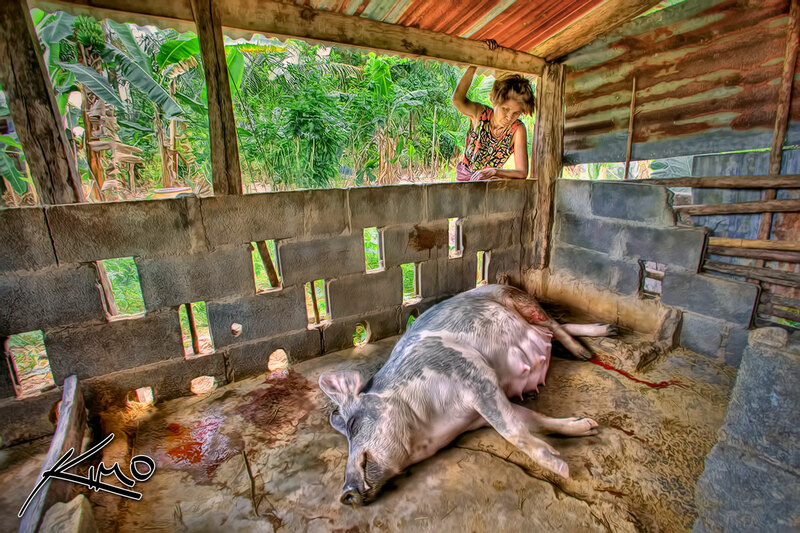 HDR photo of Grandma at the pig pen attending to her pregnant pig in labor. Grandma’s pig has already given birth to one baby a few minutes ago and is about to pop out a second piglet. I figure this was the best time to catch Grandma in action while she’s distracted. For some reason she doesn’t like being photographed next to the pig pen, could be some weird cultural thing. But she didn’t seem to mind me photographing her during the labor. She’s very proud of her pig so I’m guessing that was the reason why. This HDR portrait was processed using 3 exposures unlike my recent single exposure HDRs. Usually I only do single exposure with people because I can never get a set that aligns properly… with this shot I got lucky. Somehow all three exposures lined up perfectly, which was good cause I really needed HDR for this scene to come out the way it did. Also the shot was hand held which makes this photo even more amazing. Most of my portraits and people photos are hand held because a tripod when shooting people has too many restrictions.